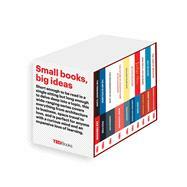 This wide-ranging boxed set of ten TED Books titles covers everything from architecture to business, space travel to love: The Terrorist’s Son, The Mathematics of Love, The Art of Stillness, The Future of Architecture in 100 Buildings, Beyond Measure, Judge This, How We’ll Live on Mars, Why We Work, The Laws of Medicine, and Follow Your Gut. Provocative, intelligent, and forward-thinking, the first ten TED Books is perfect for any curious reader interested in technology, design, and creative thinking. The Terrorist’s Son is the story of the man who planned the 1993 World Trade Center bombing—and the son who chose a different path. The Mathematics of Love is a must-have for anyone who wants to better understand the patterns of their love life. In The Art of Stillness, travel writer Pico Iyer reveals a counterintuitive truth: The more ways we have to connect, the more we seem desperate to unplug. The Future of Architecture in 100 Buildings captures the thoughtful intelligence and the sheer whimsy of the world’s most inspired and future-looking buildings. Beyond Measure reveals how organizations can make huge changes with surprisingly small steps and ultimately transform their company culture. Chip Kidd’s Judge This is a playful look at the importance of first impressions—in design and in life—exposing the often invisible beauty and betrayal in simple design choices ones most of us never even think to notice. In How We’ll Live on Mars award-winning journalist Stephen Petranek makes the case that living on Mars is an essential back-up plan for humanity and will happen far sooner than we imagine. In the groundbreaking Why We Work Barry Schwartz dispels a deeply ingrained myth: The reason we work is primarily to get a paycheck. Pulitzer Prize–winning author Siddhartha Mukherjee reveals an urgent philosophy in The Laws of Medicine on the little-known principles that govern medicine. In Follow Your Gut scientist Rob Knight and journalist Brendan Buhler explain why the microscopic life inside us matters to everyone.